Fans of Earth's largest natural satellite - and the horrifying secrets contained within - will have plenty of reason to celebrate this coming February. 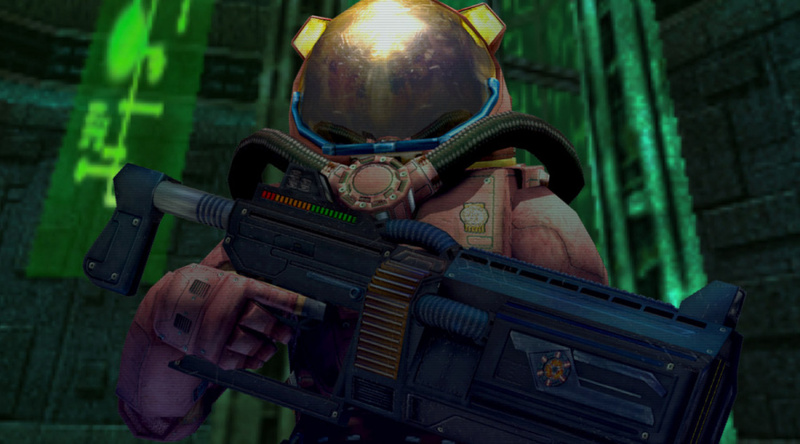 Just before the moon is torn from the sky by a malevolent spirit, Renegade Kid will be releasing the final three parts of its Sci-Fi shooter Moon Chronicles in one fell swoop. Landing in the North American 3DS eShop on February 5th, the remaining episodes will continue Major Kane's journey into that mysterious lunar hatch, and further explore the delightfully cheesy conspiracies touched upon in the original. We praised Episode One for its selection of control options and a silky-smooth framerate, which accomplished the always-impressive feat of delivering a solid first person shooter experience on a handheld. As before, episodes 2, 3, and 4, will only be available in North America at the time of writing, with each separate episode costing $4.50. Due to the nature of this simultaneous release however, all three will also be available for purchase with a season pass of sorts, which bags you all three for the discount price of $9.00. Keep in mind - players who already own Episode One will need to download the recent update before purchasing any new episodes. As for Europe, Renegade Kid has previously announced plans to bring all four episodes to the region as one complete download - we'll keep you posted on its progress. Are you ready for the month of the moon? We'll be donning our space suits for a review once the new episodes launch, but until then feel free to howl with excitement in the comments below! I will either get this day one, or hope for a sale since overall, it makes the total package counting Episode 1 (which I bought on sale for $5.99) and the DLC a total of 15 dollars on Moon Chronicles. Nice! Need to get these. When this all started there was talk of future installments (episodes) beyond the serialized rerelease of the original game. Any word on that Conor? this was fun on ds and fun again with better 3d visuals on 3ds. i look forward to the next chapters. now on to dementium! Does this game work with the circle pad pro, and hence the new c-sc-stick? If they release the whole package in UK for around £10, I'm in. Soo...explain the whole episodic release thing to me again ? Am i the only one that thinks its probably the most idiotic thing game devs ever came up with, other than DLC scam ? Oh, and by the way. Someone send Renegade Kid a globus or a world map where Europe is circled in with a big, red marker. Will get the season pass day 1, now if only a survival mode was a mode in the game. @indienapolis There definitely was, I believe labelled as a "Series 2" sort of scenario. I haven't heard anything about that lately, and they haven't put forward any information themselves, unfortunately. We'll be sure to keep you updated if anything comes to light! I'm on the fence about this. Didn't really enjoy the first episode. Will keep an eye out for a further review. It was too repetitive and uninspiring. The controls worked great but enemies were very bland. Nice! I have yet to pickup the first game but I'm going to Friday. I'll download the entire season after I get the new 3DS to take advantage of the dual stick control scheme. And yes, any game with circle pad pro support will work with the n3DS's C-Stick. I really want to play this game. I love space shooting games. Finally a good reason to nab this up!! I really enjoyed Moon on the DS. @Einherjar when i first read about it i thought the episodic thing was a good idea. good way to keep interest in a remake of an old game for months. however the first chapter was $8 or so. that was way too much for how little content there was. i guess it didnt sell well and thus why they are putting all the other chapters out at once. Is there gonna be an Australian release yet? I have no worries about the episode structure at this point, with the game being released all together (almost) the final price seems on-point. WOW. The chapters were supposed to be a 1.99 apiece. What the heck happened?Did they just upgraded the content to twice as much as initially conceived? Doubt so. Yeah, any chance of that euro release then? @JHDKoopman To be fair, that whole concept works for TV shows, but not for games. You dont really pay for it and thus, its not all that important if the pilot can grab you or not. If the first geme episode doesnt grab you, you basically payed for a demo. You lost money, dont like the game AND you cant even finish it. Then, there are people like Tim "Moneysponge McRip-Of" Shaefer. He asked for 400000$ on Kickstarter for an episodic adventure game, got 3.3million (!!!) and STILL, up to this day, hasent finished anything but akt 1 and is already planning another Kickstarter project. Its the fear that the project might never be finished, that youre investing in a game, that you might never be able to play through. This franchise screams put me on wii u where there is ZERO competition!!!! I just noticed that the EU release date for the game on the right hand side is "Q2 2014 (UK/EU)". Cooool. Been waiting on these.